The primer does not work miracles. Thorough surface preparation is essential. Loose rust and scale must be removed, and it is important to spray the surface with fresh water before applying the primer to remove loose particles and salt. On sound, brown steel surfaces ( moist or dry), the primer has an important function. The primer film "upgrades" the steel before the paint system is applied. 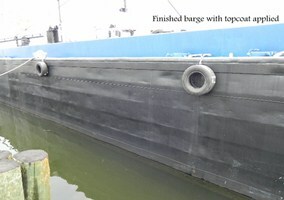 After surface preparation, the first coat of primer secures the surface, and the rest of the painting job may then be planned in more detail. 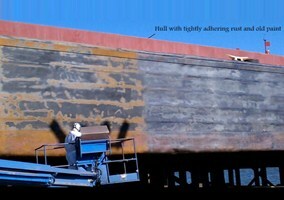 On outside work, once the primer coat has been applied, the rest of the job may be performed as weather permits. 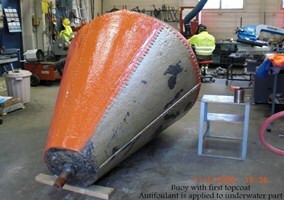 Active Rust Primer 662 SG is often used as the first coat after hydrojetting. It works just as well on clean steel, and it is not dependent on surface profiles for adhesion. Pull-off tests conducted on untreated steel using the P.A.T. hydraulic system showed averages of 14.1 MPa (approx. 140 kp/cm2).